Thanks to Honey and Jessie the boys got a trampoline!! They love it, as do the rest of the kids in the neighborhood. Their are 12 kids out there right now and Jeremy just went out to let them know only a few at a time. Jeremy and I put it together all day on Friday. First of all, it is huge. Second, it was freezing cold on Friday. Third, Jeremy had about 100 layers on. Fourth, Jeremy, Lindsey, Kimberly, Papa, and I have all been on to show off some tricks. Fifth, Gray isn't so sure about it. Sixth, thanks again to Honey and Jessie! So Fun!! Oh my goodness, I can't believe Tyler is 7! 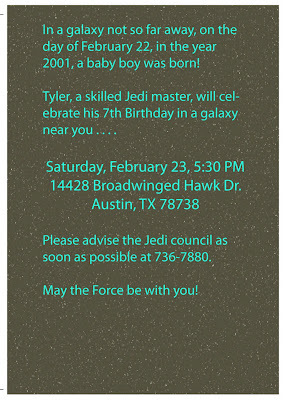 We threw Tyler a Star Wars party. We had Star Wars cupcakes, a Darth Vadar Pinata (FYI-the birthday boy got hurt during the mad rush for the candy. Let's just say it didn't go as planned.) and I made everyone light sabers (again probably not the smartest idea to give a bunch of light sabers out, I also should have given everyone a helmet). When all was said and done, it went well and I hope Tyler had fun. Money from Honey and Jessie!! As you can see, the cousins have made it to town, permanently. We are very excited to say the least. Lindsey, Parker, Kimberly, and Lawson all drove here last Monday, Wade and Derek drove the Square Cow Moover Trucks on Tuesday, and Mom, Dad, and Jax flew here on Tuesday. It has been one crazy week with the two moves and Tyler's Birthday, but I wouldn't change a thing. Mom and Dad left today and we are all sad!! Here is a picture of all the boys at Tyler's Birthday Celebration! I really do love Valentine's day. I am not a huge flower fan or the lovey dovey things that come with Valentine's day, but I love the sweets!! It is true. Jeremy and I both. So the apple/apples don't fall from the tree. We didn't give the boys any candy for Valentine's day. Note: We did make cupcakes though. I let them decorate bags the day before and then we put their gifts in the bags. They had plenty of candy from grandparents, friends, and school. It was fun and the sugar high finally wore off about 8 p.m. last night. I almost forgot, Jerm gave me a gift certificate for a pedicure (never a bad gift) and I gave him some awesome new kicks!! Lovely!! Paper Eater! Valentine t-shirts. The boys don't really get into the whole red and PINK thing, so these were their new shirts. Very Festive!! Yeah, we look nothing alike! Gray gets those blue eyes straight from his Dad. Don't you just love the boxers with the pajama shirt? We are stylin around here! !